RadioShack manager Johan Bruyneel has criticized Alberto Contador on his attack up the final climb of yesterday's stage that contributed to the demise of teammate Alexandre Vinokourov's attempt at winning a stage. He felt that the Kazakh's stage win was more important than trying to chip away at Andy Schleck's (Saxo Bank) lead in the overall classification. "It was a monumental blunder to attack," Bruyneel said in his daily blog on Het Nieuwsblad, "I know what I am talking about." During Lance Armstrong's seven Tour de France victories Bruyneel had always maintained that the entire team must be prepared to ride for one individual. Of the twenty Tour stages won by Bruyneel's teams during Armstrong's rein, only two were won by a rider other than the Texan. In 1989 the battle for yellow was decided by a scant 8 seconds and, for his efforts, Contador pulled back 10. It remains to be seen whether that time will make a difference on the podium in Paris, but with the Tour de France, every second counts. "It was obviously not an easy situation for him, but I don't think the Spaniard should have countered Jurgen Van den Broeck," Bruyneel wrote on his blog. "Vinokourov clearly had his heart set on the stage victory. 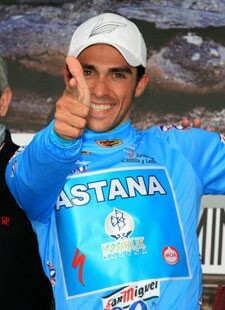 What happened in Mende will not help Contador's popularity in Kazakhstan. That I can tell you." There is no love lost between Bruyneel and Vinokourov after the soap opera that occurred with the Kazakh team last season, so his newfound sympathy for someone he has great distaste is subject. By the time Contador reached his teammate on the heels of Joaquim Rodriguez's (Katusha) attack, he already looked to have lost most of his steam. Last year Contador rode on an Astana team where he was isolated due to Armstrong's return to the sport. Now that the psychological war of words has had no affect between the two Tour champions, Bruyneel could very well be focusing his efforts on creating a situation within the Astana team. He couldn't help but criticize the Spaniard for his performances last season, where his strengh usurped a team rallying behind Armstrong. "Mende reminded me of the Tour last year when Contador rode with us," Bruyneel said. "There was Arcalis, where he attacked, despite our marching orders to wait. The situation in the mountain stage to Le Grand Bornand was poignant. Then he rode his teammate Andreas Klöden to the Philistines and Frank Schleck won." 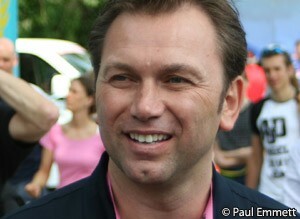 Instead of the win, Bruyneel pointed out that Astana finished second and third in yesterday's stage. "This was planned in the team's strategy today,” said Vinokourov after the stage. “I had to get myself into a group of escapees to encourage the other teams in the bunch to work. Contador would have been expected to attack on the climb to Mende based on his previous successes there in Paris-Nice, and Vinokourov had gotten into the break with that understanding. While Bruyneel is no doubt correct that Vinokourov had set his sights on a stage win at the end of the day, as a professional with a large stake in the Astana team, the value of securing the maillot jaune is his priority. If anything, he will likely be more disappointed with the fact that he didn't ride faster.